This interview is part of the Marconi Foundation 30th Anniversary Commemoration. Charles Kao starts this interview by discussing the beginning of his interest in optical communications. He talks about the creative process in making the breakthrough with fiber optics. He talks about the early experimental trials and problems when dealing with optics. He discusses the process to get an adequate transparent material (glass) in order to get the guided material. He talks about the article that he published with George Hockhem in 1966. Then, he talks about the need to get funding for their actual fabrication of the fiber. He briefly mentions his chemistry experiments when he was a child and how he was surrounded by curiosity-driven people. The interview ends with Kao’s brief comments about future changes in society due to significant new technologies. 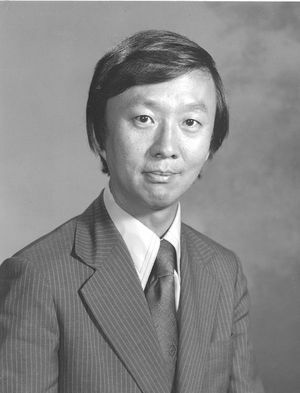 Interview # 435 for the IEEE History Center, The Institute of Electrical and Electronics Engineers, Inc.
Charles Kao, an oral history conducted in 2004 by Robert Colburn, IEEE History Center, Hoboken, NJ, USA. I was wondering if I could ask you to start with your early life and schooling, and then I wanted to ask about the creative process in making the breakthrough with fiber optics, and particularly given that most people did not think it would work and what it was like to be working against that. I’m always very interested in new things. I was working at ITT’s company in the UK, Standard Telecommunications Laboratories. The first thing that I did was sort of a routine type of R&D. However, getting a higher bandwidth transmission system was definitely of importance. The company said they had interest, so I was to think about how to push the systems to make the transmission higher broadband. At that time there were lots of people trying to get microwave systems to increase the bandwidth. Then they were also looking at the circular wave guide, which is called [a] metameric wave guide. The reason is when we increased the frequency of the carrier we could get the carrier to carry more information. At that same time we had an interesting breakthrough in the form of an optical oscillator, which is the laser. It is a coherent, mono-frequency generator, therefore it is like a microwave system—it can act as a carrier. On the other hand, these things are relatively new. It is in the late 1949, there about, and by the time that people invented the laser itself, it was early in the 1950s. When I came in, my boss, Antoni Karbowiak, who was transferred to [University of New South Wales,] Australia, and he has been working in Australia for quite a long while. He said to them, “Well, you could go and look into the optical side and see whether one could do anything.” So that was the start of my interest of looking at the optical communications. There were other peoples’ ideas of trying to see whether propagation can take place in a free space or in a guided way, and there were lots of activities that were all trials—not trials of systems, but just experimental trials. We had very difficult problems, like when we suddenly tried to get a beam from A to B and found that the atmosphere was not stable, and therefore the beam would bounce around. At the destination, you would see spots moving around as the wind disturbed the environment. Therefore the conclusion was optics may be okay, but there are many, many difficulties that we really have to investigate and see whether we could overcome these difficulties. There were lots of experiments that all indicated that disturbance from many directions can come to the beam. For example, people decided that if free space through the atmosphere is not stable, let’s put it into a tube or whatever it is, but several gradients are always not very easily controlled. Therefore, to build a pipe or something that could conduct the beam without letting it disappear, one has to invent all sorts of new things. As far as I was concerned, I was starting myself as a wave guide to the people working on microwave and planning type of thing. So my feeling was, “Okay. If we’re going to use light as the carrier, then we need to get to really a single frequency carrier, which will then have an almost infinite amount of bandwidth. So that’s the sort of shining beacon hanging around out there. Of course when we start, we have to convince all of my bosses as well as the headquarters who gave us the money, and so it wasn’t a smooth sailing type of thing. Was that a long process? It’s a fairly long process because we’re not spending much money. The team was very small, therefore, starting with myself and later on we added one or two or three people. The teams built up very slowly. Anyway, the whole thing relies on many things. One, apart from the characteristics of trying to guide the optical wave, we have to deal with things like, if we have a laser that dies every few hours, it’s not going to be very useful. And at the beginning, some of the lasers that are semiconductor types would have very short lives, as well as the fact that it cannot work at normal temperature. In fact, one has to cool it right down to certainly as cold an environment as possible, so you have to go through liquid nitrogen if possible. Then there are some reasonable lengths of time that they would survive. There were millions of obstacles. But in that time of development in the early 1960s, the environment is that esoteric research was tolerated so long as we didn’t spend too much money. I was really very happy about this situation. I could explore very many new things. Karbowiak thought that to get the guided material one has to worry about how to get a very transparent material, and that turned out to be very difficult because we really don’t know what is increasing the attenuation of having a transparent material, particularly its wavelength balance. So we need to go into all these things. Theoretically one looks into the fundamentals of what might be able to work. Nowadays one knows that even polymers can remain fairly transparent. But to cut a long story short, we went to the point where we said glass, if it is very pure. Pure in a sense that there are no inclusions of metal ions and so on that would absorb the optical waves in the frequency range that we really wanted to use, which is about the near infrared region to the visible range. And theoretically no one even expects it to work even then. They felt that it was really very difficult. Karbowiak’s argument is, “Okay, if the material is intrinsically very glossy, why don’t we try to attach the wave to the material such that much of the energy is outside the substance and loosely coupled onto the conducting frame.” He introduced the concept of putting it on the thin film and seeing whether the film can guide it with much of the energy, say ninety percent of the energy, outside the very thing. So there were very interesting arguments of whether one could make these thin films thin enough like what Harden [sic] has shown in thickness. So we had a very interesting time making very thin films. The easiest way to make it is quite easy, actually. You take a drop of solvent that has a little bit of plastic material in it and drop it onto a liquid surface like water, and just the surface staging spreads it to a very, very thin sheet. Other people knew that one could get very thin films, but never thought that it might be possible to be used. Anyway, we fiddled with this in a very learning way until the point of where we were trying to get the film to conduct the light around the bend and go backwards again. As the film gets thinner and thinner, one suddenly found one day that in a dark room the leakage of light is physically plain—-it sheds the light as it goes around the corner. As a result, we know that the radiation also is extremely high and so it is a difficult problem. Later on we decided that what was best was to try to find a material that has no loss if possible. It turns out that I suppose you can say either God ordains that there are things that are transparent, or you can say that if a material has a characteristic that has no intrinsic absorption edge at either end of the longer wavelength and the short wavelength, then there is a minimum point. At this point, one should be able to get very high transparency if there are no other contaminants. It really took us nearly three years to complete the fundamental research to make sure that everything on the chemical and on the material science side was proven. So George Hockham, who is a theoretician, and I jointly wrote the paper. What George did was to calculate carefully the propagation characteristics to make sure that coupling and radiation around the bends so that it joins sort of thing. We really did everything possible to make sure that it was a situation where we can expect long theories. So it is proven by implications mainly. We do simulation to see whether, for instance, if the fiber is sort of undulating, would the radiation be induced by the ripples and how much process would happen as well? It is a very thorough bit, and in the end I think the paper that was published in 1966--one could say was one hundred percent correct. There were only very, very distant types of trouble. For example, a long while later we eventually found that the water vapor around the fiber is fairly high. The OH molecules can actually get into the fiber and form centers which would absorb light. The reason for the presence of hydrogen is because we were using an aluminum tube as a shield, and in the vapor phase residue gets in there. The interaction could allow hydrogen to bond with the glass and then you have increased loss. A very few things like that were discovered without us exactly knowing it until we found it. So I think it was a very respectable bit of detective work as well as good theory and good fundamentals. So there was really nothing spectacular. It was really proving that the theory was correct. Then we had to go to the people for much more funding because we now had to try to develop all of these things. Once the paper had been written, did they come around to your way of thinking? Yes, predictions are always dangerous. But so far, I think fiber’s survival is because it is cheap and it’s the real main truncating of information. Certainly there are lots of other alternative things that people can use for other types of applications. For instance, if you want fiber to the house or fiber within the house and so on, you wouldn’t need the expense to use the most bandwidth fiber. So that is the sort of history of fiber. In some ways it is very interesting, because Marconi did these experiments in vacuum hoses in the sense that he really didn’t know how to get a signal from an arc to radiate sufficient radio frequency waves to be picked up halfway around the Earth. So the radio communication was established and he became an entrepreneur. In some ways all of these things are similar. Yes, it’s very similar. In particular, Marconi often used the phrase from Newton of standing on the shoulders of giants. You mentioned some of the theoretical work that had gone before, and I was wondering if you could elaborate on that. Did you have the sense of standing on the shoulders of other people, and are there people now who are standing on your shoulders? I suppose all scientific people always find it interesting to see what one could do more to stretch something that we feel could be stretched. Marconi’s imagination is that he has a very big jump when he was using the arc discharge and hoped that there were some waves that were invented because of this sparking action, and that it would contain certain wavelengths that would actually fly out into open space and could be picked up. It’s really a rather big step in the unknown because he didn’t know where the reflection would take place. I don’t think Marconi knew exactly that there is a reflecting surface above the ground. So I suppose like all of the interesting stories of science, Newton’s Laws are really quite fascinating. Although climbing up on some other giant’s shoulder, I don’t look at it that way in the sense that I admire the people that do that, but I don’t see it as a sort of stepwise progression necessarily. There are sort of spikes of discoveries that really count. What are some of the uses that fiber optics have been put to that make you proudest or happiest to see them in use that way? I’m an engineer, so my real purpose is something that is useful, and it is interesting to extrapolate how improvement can be made and if it is made; and if it is made, how it important it is to serve mankind. Communication, at this moment of my life, I still feel that it is not the invention of something that is important. It is how we can utilize that, then, to improve life that is important. Unfortunately, these days, we are contaminated by the use of the competitive forces to say, “You must say, "I did something better than the other," so the advertising people will generate things that boosts sucking up to possibly beyond what one should claim. In some ways I feel that, for instance, we now can use computers to do very, very many things. You can do many, many things that are weird and wonderful, but to what extent we need them is still not clear. The bubble burst recently of technology, particularly the IT [Information Technology] bubble, was overloaded, so it has collapsed. Obviously it is very important that we push them, but I think the peripheral ways that people look at it and get very excited are based on very thin evidence. And so I think we all should say, “Here are some useful tools. Are they going to be really helpful for us?” And we should question these carefully and use them appropriately. But that is sort of the typical way or engineering way of answering questions. I am certain there is one, because there are so many things that people have very good ideas that I really don’t know which ones could lose. However, the importance is that we need to be aware of what things are useful to us and how we do we use it so that we could improve our life. If we go to the extreme and say, “Okay, we want to live forever,” that may be challenging very different goals, because the question is, “Why do you want to live that long?” That sort of question could come up for pure aim to improve longevity. Fine, I suppose you can do that. But what the person is going to go through in terms of the suffering and in terms also of things that we don’t know, and many, many things are much more difficult to explain. As an engineer I tend not to think about those aspects too much. There are lots of things that we could do. I was wondering if I could take you back through some of your early life and schooling and preparation, and what made you become interested in engineering to begin with. I don’t know how to really answer the question because some of the things are intuitive things that may or may not be right. For example I was playing with chemistry, long before I was really old enough to really play with those things. So I got to know things like an understanding that, if you put an oxidation agent and mix it with something that is easily inflammable, [and] that if you mix the two, you are going to make a brighter spark, which I did. The actual things that I used were so lethal. I put red phosphorus powder and mixed it with potassium chlorate, which is an oxidation agent, and we’d touch it and it would go "Phooom!" and it explodes. A young boy to be playing with these things is really bad! I actually wrote about this. I made mud balls and put water in with those two ingredients and put it into the center of the mud ball and let it dry. When you throw it, it explodes. How old were you when you were doing this? Very young. So that’s very dangerous. I was making chlorine all over the place. I nearly gassed myself, I suppose. That’s the uncontrolled environment that I was in which could have led to terrible things. However, I survived. I think the most important point is that I mixed with lots of people that are curious, curiosity-driven people, and so we learned by reading, by experimenting. That opened our minds in that more flexible way without the constraint of, “You must understand this book before you can move to that book,” because the parental control wasn’t there, or they were not exactly understanding what we were trying to do. That’s something a number of the other Marconi fellows have mentioned, the importance of being with other curious people. I think that’s why one could say "is our teaching really effective?" How should a way of educating students, how should it be structured and delivered? It’s extremely difficult. Intrinsically you are implying the order that you can lay it out in, but I think we would not be able to construct the best order. Because we really probably--like, if you look at the kitten, it will explore and play and tackle. I mean the wild world: it’s always starting as a child. There is no one way to do things. The person that starts without too much constraint tend to do things differently. It depends on the parental guidance. Some parents will say, “Don’t do this. Don’t do this,” and then the little guys can note exactly how they just know, “We mustn’t do that.” That essentially cuts the possible routes that could be opened to something interesting. In your travels have you found certain educational systems that seem to better at that, or certain places where that kind of freer thinking is fostered? Well, I think this has been tried for the last few tens of years by many, many people. In Hong Kong, the government actually asks people whether they would like to run a couple of experimental schools and see how people tackle it. I think that’s a good idea, but there are poor people that are trying, that are running a little bit of a risk, or a big risk, I don’t know. But it’s necessary really to experiment with this. And one has to be very cautious. If I use the word cautious, it means that one is already very conservative. Those are the difficult issues. We cannot put people at risk. At the same time, if you don’t risk anything, then nothing will probably be achieved. Hopefully one could say that the human beings are the sensible ones. We now have lots of people and we have the problem of overpopulation. How should we do it? Are there ways that you see communications assisting in those solutions to those problems? Well, communication is one of the most important in a sense that if we don’t hear part of it, one would need to totally reinvent it by one’s self. At the moment it is extremely difficult to really sort out what do we mean by understanding anything. The computer gets a billion pieces of information a day. What do we do with it? The Marconi Foundation has been good at this, at selecting people who have made breakthroughs of improving certain things and so, on every year, by nominating the person that achieved that status. I think that’s a very good incentive. Interestingly, lots of people have very important contributions to the way they think. We don’t know how we get into that strata. But out-of-the-box-thinking is extremely important. Our circle gets tightly bound because of our experience base. I’m 70 years old now, and it’s quite interesting to self-analyze and say, “How do I think about what I should do?” My feeling is age doesn’t matter, really. It is the experience base that’s behind it, and sooner or later, at some point there is something that essentially surrounds you because you’re in the middle of it. After that, more or less, the excitement has reached the peak, once you really jump out and say, “Maybe I shouldn’t go at this.” It’s very difficult to do that. But you have. You seemed to have jumped a number of times. I have, by circumstances. For example I was trusted into trying to run a university as the president of the university, and this is a totally, absolutely unheard of honor as far as I’m concerned. How do I deal with 10,000+ people? What am I supposed to do to add some improvements? I mixed with many of these presidents of the universities and talked with them, because there are sort of meetings for presidents to gather together. The [British] commonwealth system particularly encouraged it, and then you can compare their way of thinking about it. One of the remarks that a number of people mentioned was that the education system - particularly in the United States - the university is so complex that any chief executive really finds it impossible to really make a huge change. So they choose something that maybe you say, “I’m going to do this bit to make sure it has an impact.” I think that’s a fairly good way of doing it because see you can’t say, “Okay I’m going to sweep the whole thing.” It would be a little bit beyond human endeavors. The history, the background, has to be taken into consideration. To push the thing into the future, we now have at least three very significant new technologies. One is the IT, the biotech, and the nano-technology. These three are very fundamentally changing our basic grounds that we operate on. So we are going to have a very significant change. We can’t live in an environment as it stands now because these have ground shaking capabilities. Coming up with things that would require many Socrates or whatever, many important people that I shouldn’t stand on their shoulders to see how one could do anything about it. Because it is very, very significant. Religion is going to be challenged in a very significant way, because on what basis can you say, “This religion is better than the other.” Just asking that question alone is extremely difficult. So we have to bypass many things in order to feel that one is maybe still sane. This page was last edited on 26 September 2018, at 18:21.